NELSAPPERS...People who have contributed to the New England Lost Ski Areas Project. Many NELSAPPERS have spent a good deal of time finding closed ski areas and sending information. If you have sent info and are not listed here, please let me know, and I'll send you a quick questionnaire to fill out to be listed here. This area is under heavy construction! Spencer Allen: I'm a 25 year old second shift reliability technician for Hypertherm in Hanover, NH that produce plasma cutting units for use industry for cutting metal. I hold an associates degree in electronic Engineering technology form New Hampshire Technical Institute in Concord, NH. I also has the opportunity of being the president of the solar car team at the institute and with a lot of hard work and some luck we had the best winning year in the teams 9 year history in the American Tour de Sol electric car competition this was the third and final year of being an active participant on the team for (#72 Sungo). After graduating in May of 1997 and got settled at my current job at Hypertherm I was looking for something to occupy my free time and would be satisfying and benefit others. Arrowhead was the answer. I felt and still feel that the facility has potential due to the void developing because of ski areas (resorts) getting larger and prices are ever increasing each time an area grows. Now that areas have managed to close some of their rivals and continue to grow. I feel now that their is an market for small ski areas in the area of learning to ski and for short visits by skiers (2-4 hour duration's). With that said I am performing an 5 year evaluation of Arrowhead on whether or not I personally what to make attempt to reopen the facility. During this time I have been and will be looking into all aspect of ski area operation. I started clearing brush on the slopes in the fall of 97 with the intentions of getting the slopes on to a routine maintenance plan. By the end of 98 I managed to cut down all the 10 year old jungles that were on the slopes. Stephen Bartley: I was born in Amesbury Ma. 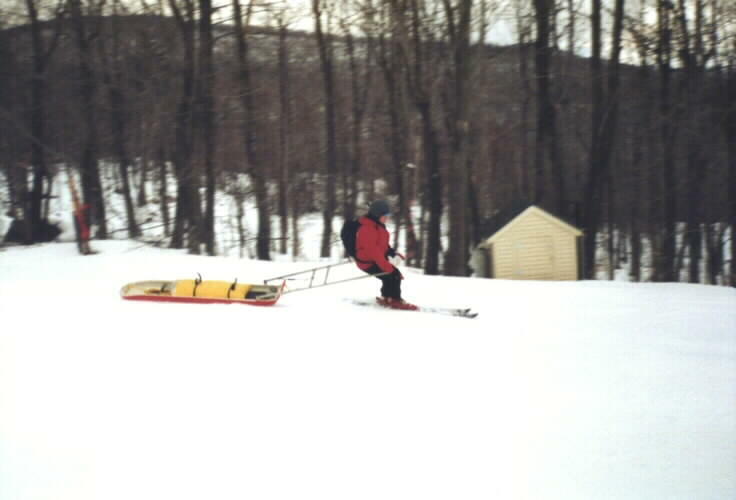 & started skiing when I was 12, at the Amesbury Ski Tow. I started working at Atlantic Forest when it opened in January 1987, becoming Assistant Manager in 1989. A lot of fun and great memories came from that hill. I still have a hat and my employee badge from my days at Atlantic Forest. Nowadays I don't ski as much as I'd like, but I do love to get up to Wildcat now and then, and stay at the AMC's Pinkham Notch Camp. This is probably as close to old-time-New England skiing as you can get in the 90s. Today I enjoy Homebrewing, camping, driving my 1963MG Roadster, and the music of Jimmy Buffett. I am married and currently live in Portsmouth NH but still work in Amesbury at the family business. Ned Bolle: I grew up with Crotched Mountain/Onset/Bobcat in his back yard, in Francestown, NH. I first skied at Temple Mt., long before the intricate maze of narrow, twisty trails was butchered to cut a fat, fall line slope to accommodate the "new" quad chair. I spent my high school years in the Berkshires, skiing at Darrow school's tow (powered by a Model T) as well as Jiminy Peak. I've been in the Boston area for longer than I care to admit. I have been a patroller for nearly ten years now, locally at a nearly lost area, Blue Hills http://www.thenewbluehills.com and at the recently found Bear Creek Mountain Club (Ski Roundtop) http://www.bearcreekclub.com/ . I really enjoy the areas that preserve the Old New England ski experience, Mad River Glen, Magic Mountain, Cannon, Wildcat, and of course, getting into the backcountry on Monadnock, Cardigan, Tuckerman Ravine and the Gulf of Slides. Here's a pic of Ned running a sled at Bear Creek in VT.
Christopher Bradford: Chris Bradford is originally from Lancaster, NH and has recently removed to Sanford, Maine. Chris is a fellow collector of lost/historical ski material. His interest in lost ski areas have even lead him into starting a company with the sole purpose of re-vitalizing lost ski areas, most recently working on a project to re-open Crotched Mt., NH. Here's his current "lost" (and found) list: Crotched Mt, NH - Highlands, NH - Whittier, NH - Nansen Ski Jump, NH - Shelburne, NH - Moose Mt., NH - Bauneg Beg, ME - Beaver Hill, ME - Mt. Eustis, NH - Watatic, MA - Mittersill, NH - Thorn Mountain, NH - Tyrol, NH - Spruce Mt.., NH - "The big A" Mt. Agamenticus, ME - Hurlery Ski Training Area, VT - Gilford Tow, NH - ... probably a few others. [ Now that its winter,its time to make the exploratory list for summer '2000!]. He has also designed the logo which appears at the bottom of the main page. Dave Hilton: Dave Hilton, founder of Forest Fire Lookouts of Maine, hails from York, ME. Dave started skiing at Mt. Agamenticus, an official Lost Area, back in 1967. His favorite area to ski now is Gunstock in Gilford, NH. He has been very helpful to NELSAP, being one of the original contributors way back in October of 1998. He enjoys fire fighting, forest fire lookout research, two-way radios, and Maine/New Hampshire postcard collecting. Dave requests that if any readers of NELSAP have any photos or information on any Maine/New Hampshire Forest Fire Lookout Towers; as well as any old NH/ME postcards and "In the Maine Woods" publications, to please contact him by emailing him here. Dave also wrote the book From York to the Allagash-Forest Fire Lookouts of Maine, 1905-1991. This book is on sale on his website. Betsy McDonough:I grew up in St. Johnsbury, VT and graduated from StJ Academy. I have enjoyed skiing at Burke Mountain for much of my life. I graduated from UVM in '96 with a BA in Geography and a Recreation Management minor, where I skied mostly at Sugarbush and Stowe (OK areas, but Burke is still better!) I have always been interested in New England history and geography , more specifically interested in the history of recreation in New England. John and Linda Osgood: . When I met Linda, in 1986, she was attending Castleton State College. One weekend while she was playing soccer or something, I took a drive around and stumbled across High Pond Ski Area, in Brandon. I went back to the dorm, grabbed Linda and took her out there; she was as excited as I was! The next week I went down to visit her at CSC again when she told me she had a surprise for me: Bird=s Eye Mountain! From then on, the occasional (and eccentric!) hobby of finding old ski areas became our shared investigational pastime. I started skiing with my parents somewhere either side of 1970 and have been fortunate enough to experience places like: King Ridge, Crotched, Tyrol, the old Sugarloaf (you know, lots of t-bars, narrow, twisty trails and ice), Methuen Hill and Boston Hill. Linda started skiing in the Morrisville, VT, ski program when she was six and the only place she had ever skied was Stowe until she met me many years later. We have tried to ski as many places as possible in the VT, NH and PQ regions. Linda snowboards and has been for many years now. Laurie Puliafico- I have been skiing since I was 5 years old. My earliest experiences on skis were at Pine Ridge, Barre, MA and Pine Acres, Oakham, MA. I became interested in the National Ski Patrol at a very young age, probably because of the influence of my elementary school principal, Roger F. Langley (who along with Minnie Dole founded the National Ski Patrol). Many of my younger ski days were spent hanging around with the ski patrol at Pine Ridge. In my mid to late teens I temporarily lost interest in skiing and became more interested in music performance, though I was never very good. When I went to college, I found out that I could get Physical Education credits for taking ski lessons, so I signed up for a beginners program. Unfortunately, but also fortunately, the instructor I was assigned was also a friend from my home town and Pine Ridge. I ended up assisting her in teaching the class. My love for skiing was back! I finished my bachelors degree in education in 1983, at that point I also enrolled in a ski instructor's course. I began teaching at Quabbin Regional High School the same year I took the instructor's course, unfortunately, an injury kept me from completing the course at that time. Several years passed, Pine Ridge closed for a brief time. When Pine Ridge reopened the Ski Patrol Director approached me and asked if I would be interested in becoming a member of the patrol, thus began my official adventures with the patrol. A short time after that the head of the ski school asked me to instruct. I have been patrolling and instructing at Pine Ridge ever since. I am currently teaching elementary level special education. Wayne Silver: I skied for about twenty years before successive misadventures with horses ended most skiing for me. I have skied in Norway, France, Germany, Italy, Switzerland, Austria and all over North America but my favorite place in the whole world is Mad River Glen. My favorite place to stay was the Mad River Barn operated by Betsy Pratt. I love skiing and New England and I think the preservation of the history is really about our precious memories of good times past. Wayne was kind of enough to xerox the New England section of two very historical and important skiing books!